Taking a pregnancy test is one of the most nerve-wracking things a woman may have to go through in her life – regardless of whether or not pregnancy is intentional. To help virtually hold women’s hands through the process, First Response has unveiled a Bluetooth, app-enabled version of its pregnancy test that can guide women from before they take the test to what to do after they receive the results. “We know that today, connected health is a growing trend but we see this as an opportunity beyond that yes or no result. They get the answer and throw the test away and they have many questions on what to do next,” First Response’s Wendy Bishop tells me. To start, download the companion app and input data like your last period, age, and whether you are trying to get pregnant. This information helps the app dictate the content you receive at the end of your pregnancy test, such as “Congratulations” on positive result for a woman who wanted to get pregnant, or a more neutral wording for one who did not want to be. Once you’re ready to take the test, the app explains exactly what to do and has a counter to keep track of the time it takes for the result to process. While you wait, it lets you choose to be kept calm (tutorials on breathing exercises), kept distracted (BuzzFeed animal videos will play), or learn more about potential results. After the result is ready, the app can provide information on what to do next or what to ask your doctor depending on your goals. You can also lock the app with a code, so no one else sees your results before you get a chance to look. I asked First Response about the nature of the “advice” given to women via the app. Most of the content seems geared toward helping women who want to be pregnant, such as help with tracking ovulation and vitamin recommendations. If you wished to not be pregnant and received a positive result, First Response remains politically neutral and recommends seeking a doctor’s professional advice for the next steps. First Response said it developed the product in partnership with Qualcomm, using research data of women between the ages of 18 to 39 in the United States. 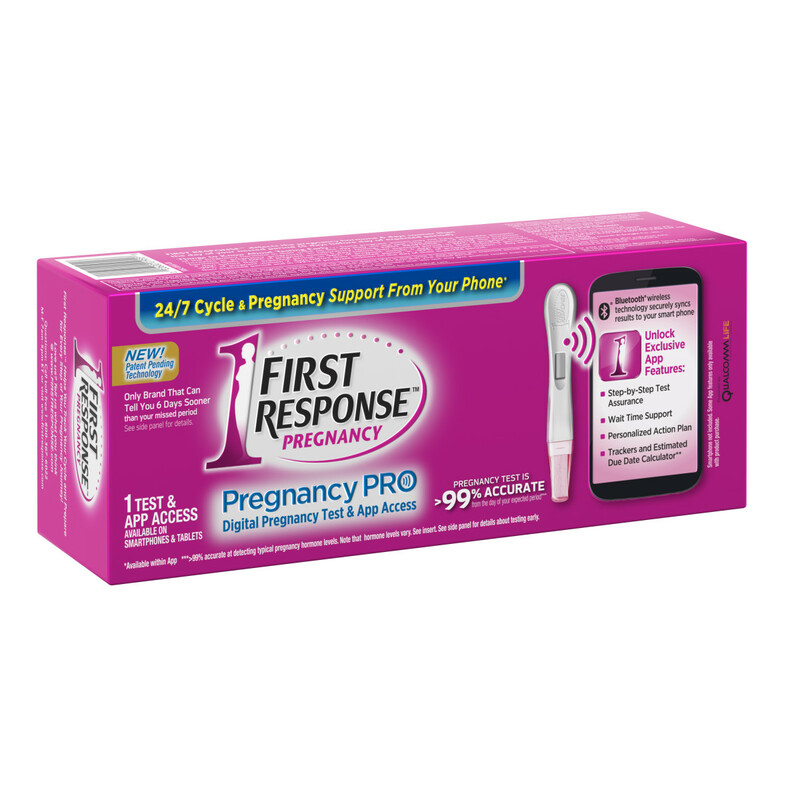 The company found that 63 percent of women increased their smartphone usage after becoming pregnant, and that roughly 80 percent of those who access First Response’s website do so via mobile. Starting at $14.99, the ‘smart’ pregnancy test is about double the cost of First Response’s traditional test. It won’t replace a doctor’s advice, as it isn’t intended to, but that extra cost might be worth it if you need a little bit of assurance to help you through the first steps of potential motherhood.